Egy meglepő és izgalmas brazil bourbon kávé melyre jellemző a hibiszkusz, mogyoró és egy édes, tiszta ízvilág. A stunning and exciting, sweet and clean brasil bourbon coffee with hibiscus and nuts in the flavour profile. 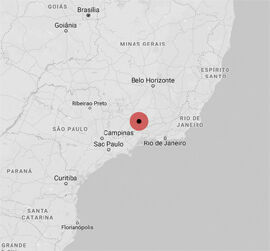 Sitio Pe de Cedro is located in Pouso Alto, in the highlands of Mantiqueira de Minas. The altitude in this region varies from 1000 to 1250 meters above sea level. The current owner, Edson Morais de Barros, bought the estate in 2012. All harvesting at Pe de Cedro is manual. One of the essential coffee practices is processing cherries the same day of harvesting. Pe de Cedro uses the classic Pinhalense machine for depulping. This removes the cherry skin and basically all mucilage from the parchment. This parchment then goes to the drying patio. The quality team spreads out the parchment in a thin layer for drying. They watch over the drying process, raking the parchment regularly so the beans dry slowly and uniformly.